^ Pohlad 1, Carl Pohlad, Edina, MN. ^ Pohlad 2, Carl Pohlad 2006 FEC filing listing Edina, MN as home address. ^ Newsweek, America's Top Public High Schools. ^ "Contact Us." Regis Corporation. Retrieved on January 26, 2011. "Our corporate address: Regis Corporation 7201 Metro Boulevard Minneapolis, MN 55439"
^ "Edina city, Minnesota." U.S. Census Bureau. Retrieved on January 26, 2011. ^ "Corporate Offices." Dairy Queen. Retrieved on May 12, 2010. "International Dairy Queen Corporation 7505 Metro Blvd. Minneapolis, MN 55439-0286" "Orange Julius of America 7505 Metro Blvd. Minneapolis, MN 55439-0286"
^ "Street Map." City of Edina. Retrieved on May 12, 2010. ^ Retailing, Southdale shopping Center was also the first indoor shopping mall. The Economist, December 19, 2007, June 12, 2009. 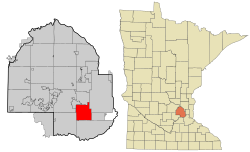 ^ Minnesota Historical Society – History of Southdale Mall, .